KEROSENE is the cooking flame in the kitchen for a large part of Delhi's households. This most basic of liquid fuels has for years been provided by the government's public distribution system (PDS), a classically corrupt and decentralised system, to people who usually turn a blind eye to the bent "fair price" shopowners siphoning off to the blackmarket just about everything -- except precious kerosene. A belated diversion evaluation exercise by the Delhi food and supplies department, initiated in May this year, came out with the first results in mid-August. Identifying for the first time ration card holders with cooking gas connections (there are 13.5 lakh LPG connections in Delhi, out of which there are entries for only 3.5 lakh in ration cards), it revealed the cause of the domestic fuel famine that is currently raking Delhi and promises to send it into a raw frenzy. Pilferage through the heavily-subsidised PDS is mindboggling: of the 28 lakh ration cards in the city, over 5 lakh that were found "misutilised" stand cancelled as a result of the exercise. The expose highlights the distorted systemic logic governing the pricing and distribution of cooking fuels. The result is a biased domestic energy availability situation, with the needy sections paying an inflated price and the middle class leaking subsidies through their ears. Only 3.5 lakh card holders had filed their declarations by the time the first deadline for declaring ration cards expired. The department then warned that if card holders failed to respond by the next deadline expired on August 1, supplies against their cards would be suspended. The declarations immediately shot up to 6.5 lakh. The department then followed up with a door-to-door survey on September 3, cancelling the 5 lakh cards on 2 grounds: that the card holders had moved residence, or that the cards were outright bogus. Delhi supplies minister Lal Bihari Tiwari confesses, "The exercise was launched merely to ascertain the cooking fuel requirements of the Capital. It later found that ration cards were being used by fair price shopowners to draw kerosene from the PDS, either diverting from the targeted sections or selling at very high rates." With just 13.5 lakh families with gas connections -- out of 28 lakh ration card holders in a city of 98 lakh-odd people -- the dependence on kerosene, coal and firewood is on the steep side in Delhi. The Delhi commissioner of supplies, G S Srivastava, says, "The annual requirement of kerosene in Delhi is estimated at 3.87 lakh kilolitres (KL), but the availability is 3.06 lakh KL." With rising oil import bills, the Union ministry of petroleum forced austerity measures in 1990, freezing the supply level of kerosene at 8 million metric tonnes countrywide. A steady reduction was sought in kerosene consumption through streamlining its supply and efficient cooking devices. Government officials, however, defend the failure of the programme. A deputy commissioner with the food and supplies department says, "The crisis, if we call it so, is artificially created. The reasons are the high subsidy on kerosene, the controls on distribution and the refusal by those in power to accept that the demand for the fuel is going up." With power cuts routine in summer, kerosene is used to run the thousands of both domestic and commercial generators bought every year. There are scores of factories in the burgeoning industrial estates which use kerosene for washing and other purposes. Add to these the fact that since, till last year, there was no open market for kerosene. The dependence on the blackmarket was inevitable. Says Pawana Murthy of the jhuggi-jhonpri cluster in Jal Vihar in South Delhi, "There are 5 members in my family. 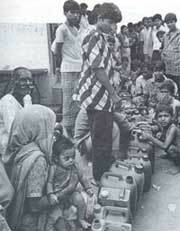 We are entitled to just 12 litres of kerosene on our ration cards, which is insufficient for our needs." Duleep Saha, a daily wage labourer in Sonia Vihar near Wazirpur barrage, says, "After coming to Delhi 2 years ago, my family was using wood and charcoal for cooking. But with our financial situation improving, we have now bought a kerosene stove." According to Tiwari, "The problem appears especially during the summer months when only about 24,000 KL of kerosene is received every month, whereas in the winter the availability increases to about 29,000 KL." The demand peaks in the summer largely because of the thousands of generators that have become a common feature in the Capital's homes and shops. However, the joint secretary with the Union petroleum ministry contends differently: "The demand for this fuel is going up because of the transport sector, which has emerged as a major consumer of kerosene during the last decade." A survey released in July 1994 survey by the National Council for Applied Economic Research (NCAER) has revealed that the covert diversion of kerosene from the domestic to the transport sector has acquired major dimensions. Says I Natrajan, director, NCAER, "Although there are no exact estimates of the quantum, kerosene is being used as a substitute for high speed diesel oil (HSDO). This is neither a new phenomenon nor is it restricted to cities like Delhi and Bombay." R K Madan, general manager (coordination), Hindustan Petroleum Corporation, reveals, "The oil companies are aware of the diversion of kerosene to the transport and industrial sectors. Raids are conducted and checks are made but the malady is so extensive that more stringent measures have to be adopted." Bhagat Singh Shekhoin, a truck owner in the Punjabi Bagh transport market, admits, "Truck drivers mix kerosene with diesel because kerosene is cheaper and adds to the profit margin. But the real largescale substitution takes place at fuel outlets." Chhajju Ram, an autorickshaw driver from Khanpur village, confesses, "I add about 3 to 4 litres of kerosene to my 10-litre tank to boost my income. This is done only in rented autos as the adulteration affects the engine." The manager of a fuel outlet in Vasant Vihar alleges that the mixing of kerosene in diesel is done at the behest of owners. K Muralidharan, regional manager (coordination) of a petroleum company in Delhi, points out, "The availability of kerosene in Delhi is much better than the 2 neighbouring states of Uttar Pradesh and Haryana and a large quantity of fuel crosses the border." Joginder Singh Jogi, secretary, Consumer Federation of India (CFI), says, "CFI has estimated that roughly 50 per cent of the kerosene made available in Delhi through the public distribution outlets is diverted." The diversion of kerosene takes place both at the distribution and retail outlets of the PDS. The retailers usually know the exact number of LPG owners who never turn up for their quota, and feel free to sell the surplus in the blackmarket. The distributors also use ingenious tricks to divert kerosene to the industrial and transport sectors. Says Jogi, "Usually, 5 per cent of the fuel supplied evaporates. But the distributors show 10 to 15 per cent evaporation. The remaining amount is sold in the blackmarket." Agrees Tiwari, "The major diversion is from the kerosene outlets, especially by misutilising the ration cards of those not using kerosene." He contends that during the past 5 years, the consumption of fuelwood and coal has dropped. But there are those who disagree. Take, for instance, the way Kailasho Devi of Badarpur decides fuel options. She is one of the few to have access to all 3 sources of energy -- LPG, subsidised kerosene and firewood. She uses LPG for her small roadside tea stall. "For my domestic cooking I only use firewood and keep my kerosene stove as a standby," she says. Bashir Khan, who came to Delhi just 3 months ago and works as a daily wage labourer, says, "I cannot afford kerosene as it is difficult to make that one-time investment in a stove. I use firewood instead. Most of the people in the slum are using wood shavings or pieces of wood collected from the trees in the area." Madan argues, "The scarcity is also artificially created by profiteers. This is evident from the fact that kerosene is usually available at Rs 8-9 per litre while the fair price shops, where it should be selling for Rs 2.57 per litre, display 'not available' signs. It is common knowledge that fuel is available at so-and-so shop or house." The owner of a prominent general store in Kalkaji says, "We have a deal with the outlets in the area and receive about 250 litres of kerosene every month. Our customers are mostly construction workers who don't own ration cards. Several transporters in the area are also good customers." The fuel option in most areas is determined more by availability than by the prices. For many consumers, cheaper fuel from the PDS is not enough and they have to depend heavily on the blackmarket. Devilal and Ramchandra, 2 brothers who live together with their families in Navjivan camp in Govindpuri, have to buy an additional 8 to 10 litres from the blackmarket. The extent of the racket is clear from the fact that the impounding of the 5 lakh ration cards will save over 8,000 litres of kerosene that might otherwise have gone into the blackmarket: at Rs 9 a litre in the underground, the blackmarket has lost Rs 92,000 at one go -- a tip of the iceberg. The diversion and blackmarketing can also be attributed to the price difference between different fuels. The cost of diesel at approximately Rs 6 per litre and petrol at Rs 16.78 per litre compares mightily unfavourably with kerosene. Officials at the Union petroleum ministry feel that "the reason why the fuel is diverted is its low price compared to other fuels" and that fuel prices need to be rationalised. As far as the impunity with which shopowners sell kerosene is concerned, Tiwari asserts, "We are trying to curb this through more checking at individual shops and through door-to-door investigation to ascertain proper utilisation." Even the oil companies have attempted to stem the diversion by adding a dye into kerosene targeted for the domestic sector. Says K Murlidharan, regional manager (coordination) with Hindustan Petroleum, "A chemical called furforal is mixed in kerosene meant for the domestic market. If this kerosene is present in diesel, it turns pink during tests." There had earlier been a plan to colour PDS kerosene with a blue dye to prevent its sale outside the shops. Jogi feels that officials of the enforcement agencies, supposed to stop such pilferage, are either hand-in-glove with the profiteers or lack the motivation to stem the rot. He says that the CFI is trying to curb blackmarketing of kerosene through "independent action". The move in 1993 under the open import licence to allow private entrepreneurs to import and sell kerosene is being regarded as a step in the right direction. Although this move has given the privileged business class better options, it is yet to be seen when the search for fuel to cook 2 square meals will cease being a battle for the economically weak.